Most often I start making DIY gifts + their gift wrapping super last-minute. 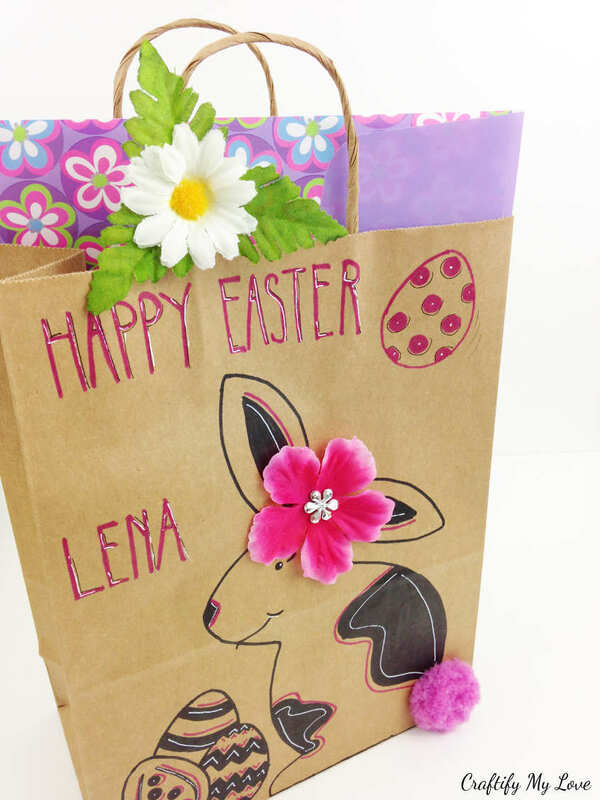 Last year I’ve whipped up these upcycled Easter gift bags for my god-daughter and her sister literally minutes before I needed to leave the house for our Easter get together. Being a super efficient person, I never want to make things twice if I don’t have to. So I mostly take the extra minute or two to document the production process for you and risk arriving late to the party. 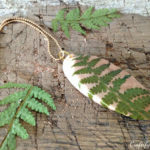 Interested what DIY gift ideas or crafts kept me from being on time so far? It happened for example HERE and HERE and even to a friend’s wedding – the tutorial is not up yet. My family and friends have gotten used to this quirk over the years, lol. Don’t forget to download your Free Templates HERE. They are a thank you for subscribing to my newsletter. All of the supplies I used where already in my stash for a long time (I’ll link to the original crafts I bought them for throughout this post for you). You simply have to work with what you have at hand & be creative if you are a last-minute creator like I am, lol. 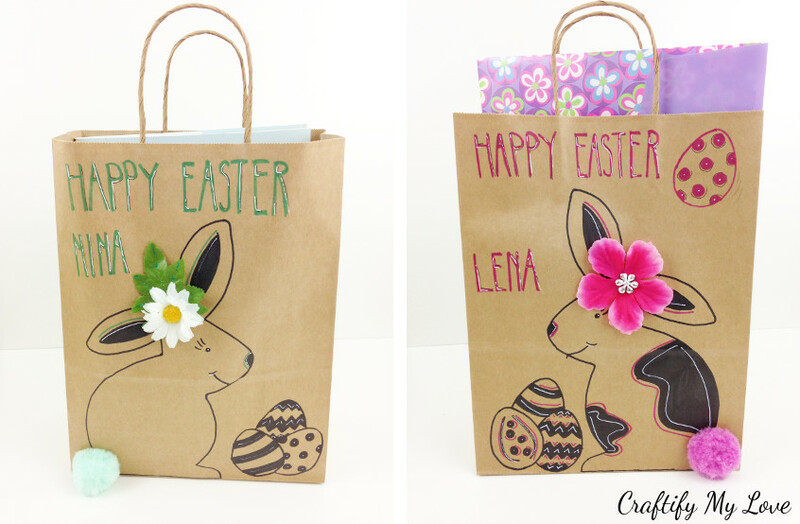 So obviously this Easter craft tutorial is perfect for Megan’s monthly Craft Room De-Stash Challenge, don’t you think? At the end of this post you’ll find my friends creations. Make sure to check them out! I am still working on the little Video Tutorial for you. If you enjoy visual learning same as I do, make sure to sign up to my YouTube channel HERE so you don’t miss out. Download, print, and cut out Easter bunny & eggs FREE template. Remember, it’s a thank you for subscribing to my newsletter. If you want to improve your handwriting, grab the FREE Practice Sheet for my tall&skinny hand-lettering font, too. I came up with it while making these Heart-Shaped Wooden Herb Markers. 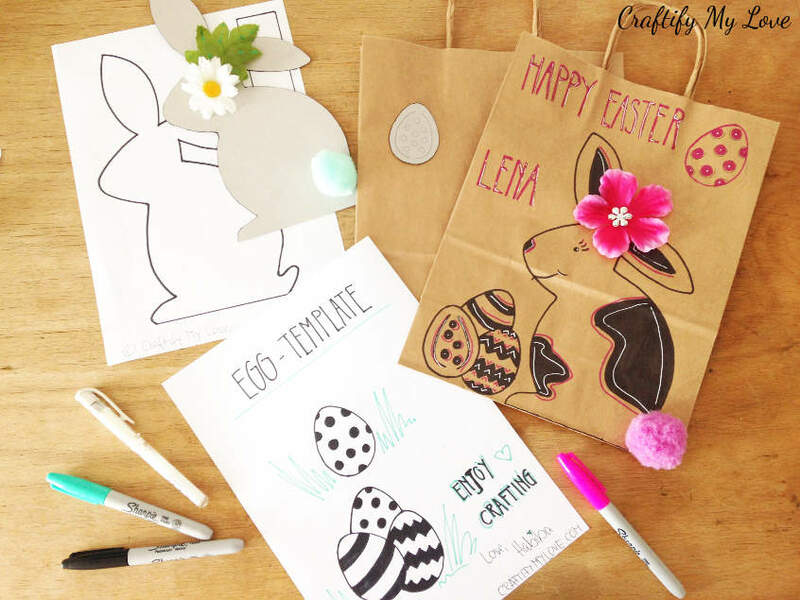 Using a black Sharpie marker, trace the bunny shape and some easter eggs onto one side of a Brown Kraft Paper Bag. If you make several you can mix things up by flipping the bunny template over, adding some markings to your bunnies fur, and giving the Easter eggs a different design pattern. 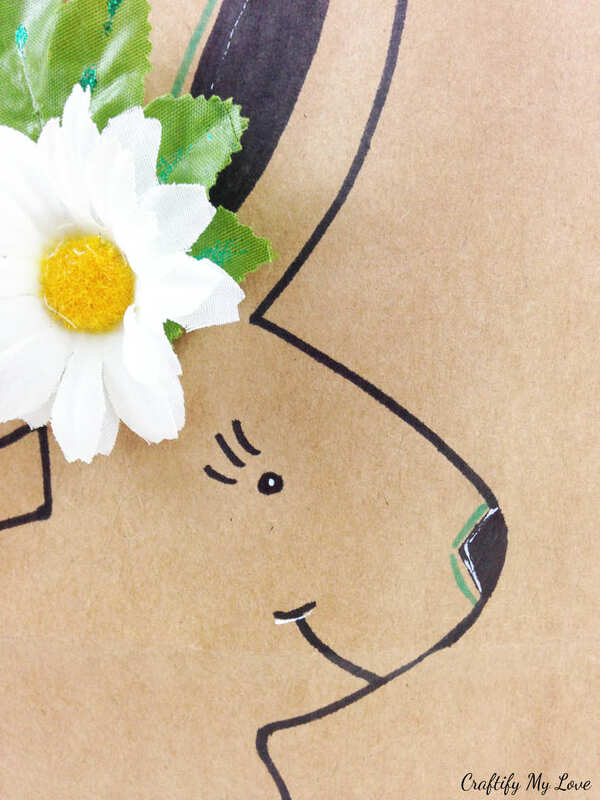 Don’t forget to draw your little bunny a happy face (see photo above). Add a little note or the recipient’s name. Lastly, it’s time to decorate! Add silk flowers, Rhinestones, Pom Poms, and whatnot using your trusted Hot Glue Gun. Use Sharpies, a White Gel Pen or some glitter glue to add highlights to your design. I still had some of those darling Flower Pegs I made for my Bent-Wire Memo Board Remember. I clipped them to the top to keep the gift bags closed. If you want to spruce up your Easter gift idea & make it extra special, why not write a little note on it in German?! Either on this gift bag or a Handmade Card. Happy Easter! >> Frohe Ostern! Let me know if I can add to this list for you. I would be more than happy to do so! Learn how to DIY those darling Flower Pegs HERE. Read up on their multiple purposes, too. 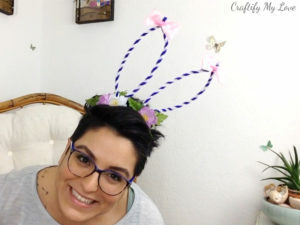 Make a Motivational Cardboard Cut-Out Sign from your leftover silk flowers or a Bunny Ears Headband. 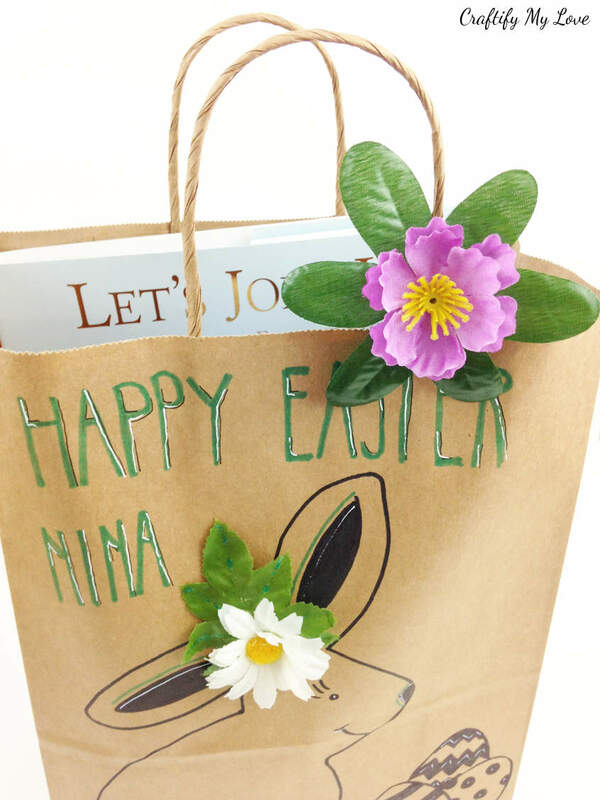 I added a little Glitter Glue to the green leaves of the daisy decor of my second DIY Easter gift bag. How do you celebrate Easter? And are you giving away Easter baskets or gift bags? I’m sure you’ll love this handmade Mixed-Media Easter Card, too. Click through and you’ll learn how to crochet a little Easter bunny charm. You’ll find even more Ester ideas over at AllFreeHolidayCrafts.com. How fun! I love adding the flowers to give the bag some dimension. It’s always great to use what we have. Pinning to my Easter board. Thank you for the share, Beverly. Yeah, I like working with my ever growing stash. But I also love buying craft supplies without having a project in mind. Lol. These are too cute, Habiba! And the idea can be used for just about any holiday or special occasion just by changing up the graphics and accessories! Yep! I bought the paper bags for Christmas but didn’t take quality photos back then. Glad you like them. What a great way to dress up a plain bag! You artwork is so cute! Thank you so much, Roseann. I had fun making them. Very cute! I am sure your cute and sweet gift bags were a hit! They sure were, Lauren. The girls played with them afterwards and had a lot of fun doing so. Love these bags and I can imagine these for all sorts of occasions! You are so right, Claudia. They are very versatile. Such s cute Easter idea! I really love the eggs. Such a cute design! I’m pinning this to my Easter board! You’re most welcome my dear. Happy crafting. I’m sure these were a big hit and you will be asked to make them again for many more years. I like how they continued to reuse them for other things. Great project. That is what I like the most, too, Donna! This way my time was not wasted for only a gift wrapping but gave them also a little play fun. Beach buckets are a fun idea, too! Thank you for telling me.